If there are many guests, two soups may be served, with one at each end. The other serving dishes, matching in size and shape across the table or on the diagonal, are placed on the table but remain covered. 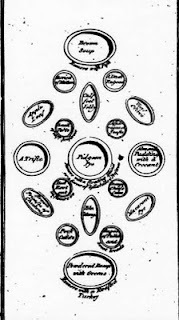 [see diagram from Frazer 1791, 1820 and Briggs 1794 below right] A few authors, such as Mrs. Parkes [see below] wrote to put it at the top. Once the soup has been served and finished, the bowls and tureen are removed and the 'remove' put in its place. Then all the other dishes are uncovered and the first course continues. The picture is by Mary Ellen Best in 1838. When the dinner is on the table let the plates be put round, one for each person; let the soupplates be all put at the bottom of the table, a little to the left hand of the person who helps it, and close to the tureen; this will be more convenient than putting the soup-plates right in front, both to you and the person who serves. ... As soon as the company are seated, if there is soup, take the cover off; if there be only fish at the top and a joint at the bottom, remove the cover from off the fish and the sauce-boat which belongs to it. Nor, unless the party is a large one, is it as usual as it was to have two dishes of fish, and two tureens of soup. 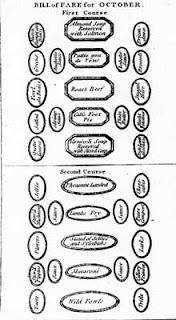 One of each, for a party of nine or ten is thought enough, the soup is placed at the top of the table, the fish at the bottom.